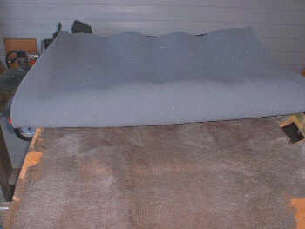 Home/Auto Headliner Faqs/Even more headliner questions/What about old, bad, brittle headliner boards? 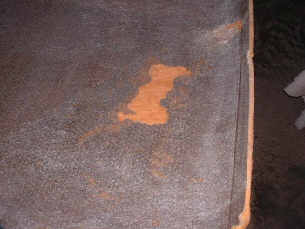 This is a 84 Chevy truck headliner which had a spongy, deterioated headliner board. We were gentle with removal of old material and with the board; and the install job went well and looked fine. 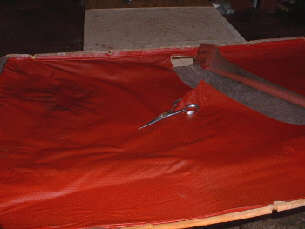 When removing the material on an old board; it is always good to cut it and pull it from the middle to the outsides of the board very carefully. 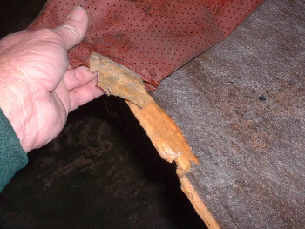 The material is usually still attached somewhat where the trim covered it and with an old fiberglass headliner board; it doesn't take much to pull it apart. 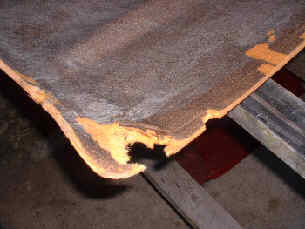 Pull the material up from the edge of the board; and as you can see; it will still take some of the board with it. There are going to be places on the board; when it is and old spongy, brittle board; that the board comes apart. Try to not take over 1 layer from the board; because the more layers, the deeper the hole will be. 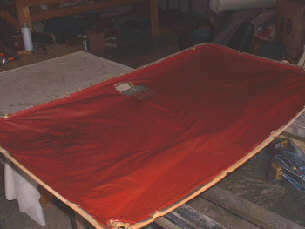 When the material is removed; brush the board off -- GENTLY -- to remove the old foam. There is almost no way with an old brittle board; that you won't tear it up a little bit; but nothing so bad that it can't be recovered and look good. When ready -- reapply the material and the results should be good.